Other Notes: 75 IBUs. Malts – Red X. Hops – Amarillo, Cascade and Mosaic. Brewer Description: (from bottle) Pat-ASK-ala? Pata-SKALA? Pa-TASK-a-la? While those in the know favor the third pronunciation, no matter how you say it, this is a unique red IPA. 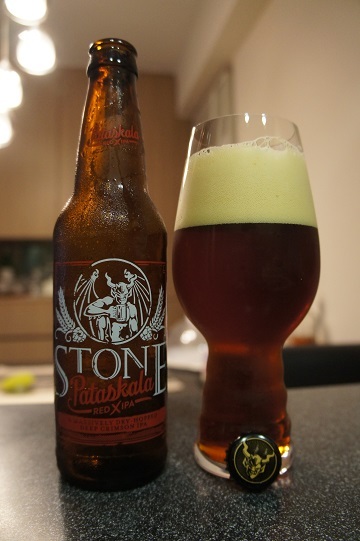 The beer was first brewed in September 2015 to support music and arts education programs in Pataskala, Ohio, where Stone co-founder Greg Koch grew up. People there loved it, so we added the beer to our seasonal lineup, and the Pataskala name stuck. 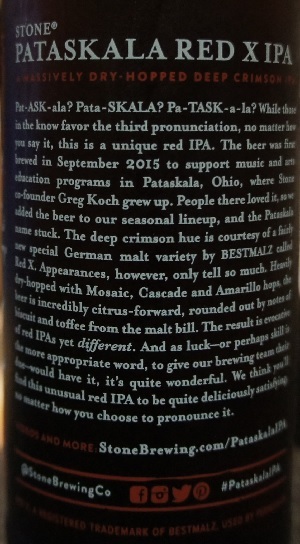 The deep crimson hue is courtesy of a fairly new special German malt variety by BESTMALZ called Red X. Appearances, however, only tell so much. Heavily dry-hopped with Mosaic, Cascade and Amarillo hops, the beer is incredibly citrus-forward, rounded out by notes of biscuit and toffee from the malt bill. The result is evocative of red IPAs yet different. And as luck – or perhaps skill is the more appropriate word, to give our brewing team their due – would have it, it’s quite wonderful. We think you’ll find this unusual red IPA to be quite deliciously satisfying, no matter how you choose to pronounce it. Intro: A 12 fl oz bottle with a bottled on date of 1st December 2016 and enjoy by date of 10th September 2016. Poured into a Spiegelau IPA glass. Appearance: It poured a clear deep ruby crimson red colour with a big three finger puffy tanned head that had pretty good retention and nice sticky lacing. Aroma: Strong tropical fruit aromas with mango, passion fruit and peach leading the way. Some orange, pine and lemon creep in towards the end. Taste: Wow, sweet sweet candy orange (think orange gummy bears), followed by some biscuit malt before finishing with bitter grapefruit, citrus zest and pine. Mouthfeel: Dry, medium bodied and medium carbonation. 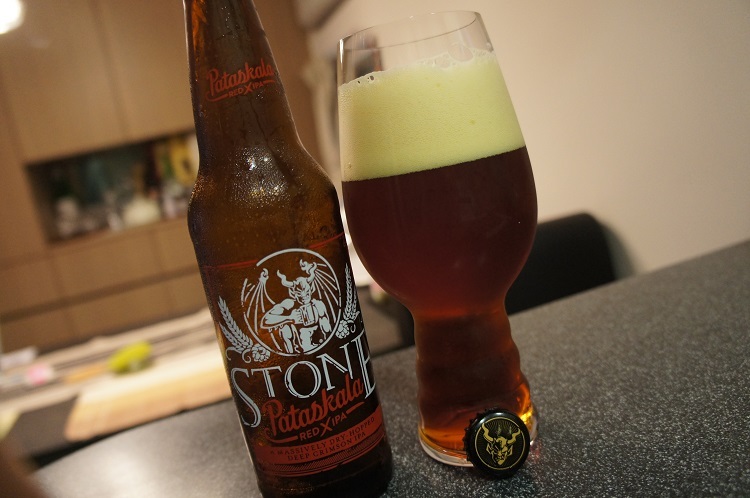 Overall: I really liked its appearance and aroma, but taste wise, it was too sweet for me at the beginning. The bitter finish was nice but could not cover the over sweetness at the start.